This July, Malcolm Dragon will face a foe unlike any he's tangled with so far: U.S. President Donald Trump. On the cover of July's Savage Dragon #226, Malcolm Dragon, his wife Maxine, and their triplets are on the run from Trump, who is a looming, monstrous figure in the background spurring everyday people to violence against the Dragon family, whom he calls "aliens." Dragon, Malcolm's father, was an alien; Malcolm's mother was a (super)human woman. The cover itself is an homage to Gil Kane's cover to Daredevil #96, which bore a similar image and the caption "Legion of the Lost." Savage Dragon went with "The Torment and the Tyrant." Torment has been one of the more regular Savage Dragon villains since Malcolm took over the comic from his dad. It's not clear whether he's involved with the story, or whether the word just fit the alliterative scheme of the original cover. 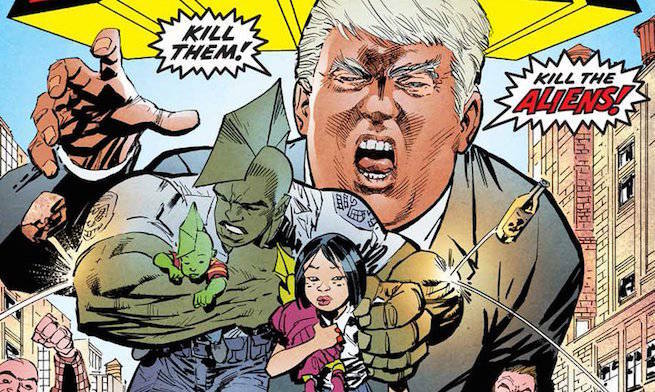 In Savage Dragon #218, Erik Larsen's long-running creator-owned series became the first major American comic book to address the election of Donald Trump to the office of the President of the United States. The reaction, provided by Malcolm while watching Trump's acceptance speech on TV? At the time, Larsen assured readers that the line would have been there if Hillary Clinton had been elected, too. "That page was the last to go out," Larsen told ComicBook.com at the time. "I knew I was covering the election but I wasn’t sure how it’d go. No matter who had won, the reaction would have been essentially the same: we’re f---ed." There was, at one point, a time when he considered making it more a part of the issue's story, but there just wasn't the room. "I was going to have two time-traveling assassins show up—one from a future where Clinton took office and one from a reality where Trump did and in both realities things just went to hell," Larsen added. "But logistically, it was problematic, and I simply didn’t have the space." Larsen said that when he was growing up, he always enjoyed seeing the President show up in The Incredible Hulk. "It seemed like there was a presidential portrait of sorts with every new administration," Larsen said. "I’ve made it a point to do that as well and I kind of wanted to just get it out of the way." Of course, with Savage Dragon having been set in Chicago since its beginning, the Obama presidency was a little more "present" than previous administrations had been, right up to an issue where Dragon (not Malcolm, but his father, who used to be the series lead) met the President. Later, Obama would pardon Dragon for various crimes committed while he was not in control of his body. At the time, Larsen told us he didn't know whether Trump would play a major role in the comic. "I’m in a 'wait and see' mode on that. Definitely in the run up to the election there was some serious race baiting and tensions were super high. The guy has been on nearly every side of every issue, so it’s really hard to know what to expect from him as a commander-in-chief," Larsen said. He said that if he perceives Trump as a particularly poor President, he would feel obliged to address that in-story, but if the next four years are relatively unremarkable they probably won't make it into the comic, concluding, "You never know. If Trump’s presidency is at all significant I might touch on it again." The protests and riots that followed Trump's election made its way into Savage Dragon as well, and Malcolm struggled to deal with both Trump supporters and detractors having problems with him (because he's an alien and a police officer, respectively). Asked about the decision to feature the new commander-in-chief so prominently, Larsen matter-of-factly told a fan on Facebook, "I had a story I could get out of it." That story will be the first major tale to come out following the reality-bending "The Merging of Multiple Earths," which runs from this month's Savage Dragon #223 through June's #225 and deals with Mister Glum trying to rewrite reality. Along the way, it appears Malcolm's dad will get his powers back...which may or may not be good news for Dragon. Look for more details on Savage Dragon #226 in the July solicitations, coming later this month. You can see the complete cover in the attached image gallery.